Sen. Jeff Flake wants to see a GOP primary challenger in 2020 who espouses his views, the Hill reports. "I mean, it would be a tough go in a Republican primary," he says on Meet the Press. "The Republican Party is the Trump party right now. But that's not to say it will stay that way." Flake is also pressing for legislation to stop President Trump's tariffs, per Politico. "You know, tariffs are awful," he says. "Tariffs married to uncertainty is probably even worse." CIA Director Mike Pompeo says North Korea will get no concessions before talks with President Trump, Politico reports. "Make no mistake about it," he says on Fox News Sunday. "While these negotiations are going on, there will be no concessions made." Pompeo adds there's nothing to fear from new Russian nukes. "We are following and tracking all of this closely, as are our brothers at the Department of Defense," Politico quotes him as saying. Warren is the real "flake". Chuck Todd... flaming the fires of speculation. 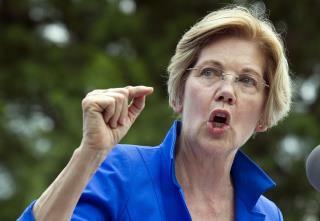 As for Warren running for POTUS, it wouldn't matter anyway. Shes another rank politician in the same vein as Clinton and is unelectable for this office. Another sure way for the Democrats to go down in flames. The US needs a viable 3rd party candidate to announce early enough to beat the rigged system.